​Sturm Elevator has been family owned and operated since 1911. Of all the elevator companies in Portland Oregon, we’ve been providing elevator services in Portland the longest! Sturm Elevator has over a century of experience bring our customers the very best residential elevator installation and home elevator service, repair and maintenance in Portland and throughout the state of Oregon. ​If you’re interested in learning more about Portland residential elevators, call the Sturm family team at 503-284-2003 for your free estimate and consultation. Installing a residential elevator in your Portland, OR home is a big decision. Sturm Elevator is here to guide you through the home elevator installation process and provide you with both the top of the line residential elevator equipment, along with unmatched service and value. Without question, residential elevators add value to any home. A modern elevator is a luxurious and impressive addition to a multi-level house or condominium. More importantly, home elevators can restore mobility and ease of movement throughout a home, while also offering greater safety. Any homeowner or resident with difficulty using stairs or moving up and down the levels within a home can benefit from a residential elevator installed by Sturm Elevator. One of the most common questions we’re asked is “What do home elevators cost?” To really give you a qualified answer about the cost of residential elevator installation in the Portland area, we’d invite you to give us a call at 503-284-2003. A member of our team will be happy to offer you a no cost, no obligation home elevator installation consultation and free estimate. We have lots of options and a home elevator is actually quite customizable, both in terms of features and budgets. We can help design a solution for your home that our residential elevator installers can then bring to life. If you’re searching for Portland residential elevator installation, you really need to give us a call! Sturm Elevator is the oldest elevator service in Portland Oregon, and we’re family owned and operated. We believe that’s important because we treat our customers like family. Everyone on the Sturm team, including the owners, our office and administrative team, our home elevator installers and our elevator journeymen mechanics are dedicated to your safety and complete satisfaction. 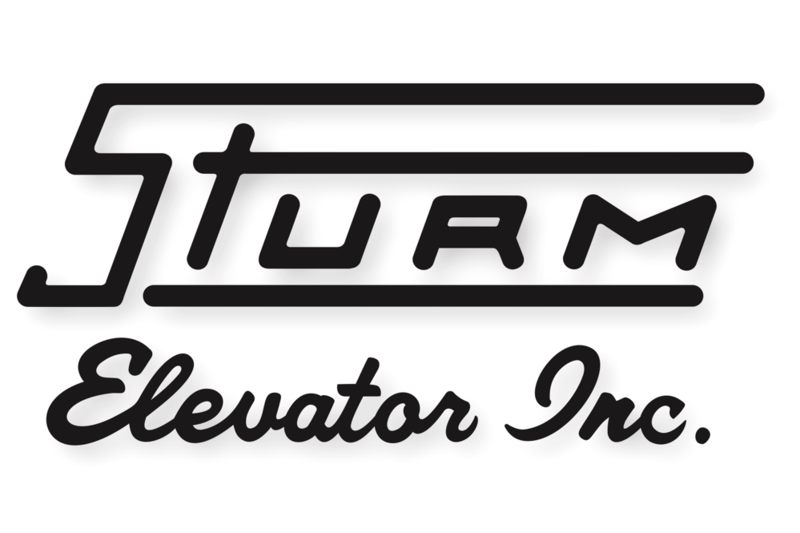 For over 100 years, Sturm Elevator has been Portland’s top provider of home elevator maintenance service and repair. Our experienced team provides both regular servicing and maintenance of residential elevators, along with repairs for break downs and emergencies. Maintenance costs for home elevators are actually very affordable when compared to the potential costs involved when an elevator is neglected and allowed to fall into disrepair. If you’re a homeowner concerned about the cost to fix an elevator in your house, or you’re a buyer considering a home with an existing residential elevator, reach out to the Sturm Elevator team for a complimentary consultation. We’ll provide you with a no obligation, free estimate and give you an honest, expert analysis covering the best maintenance, repair and servicing options for a residential elevator. Sturm Elevator provides both elevator modernization services and residential elevator replacement for homes in the Portland area with existing elevators. 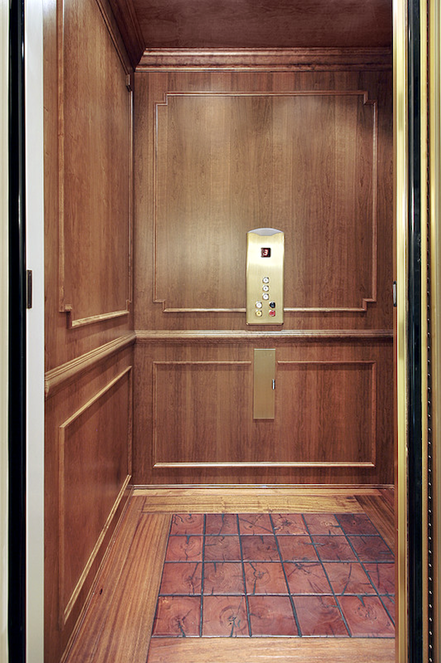 Contact us to find out if modernization or replacement is the best option for the elevator in your home. 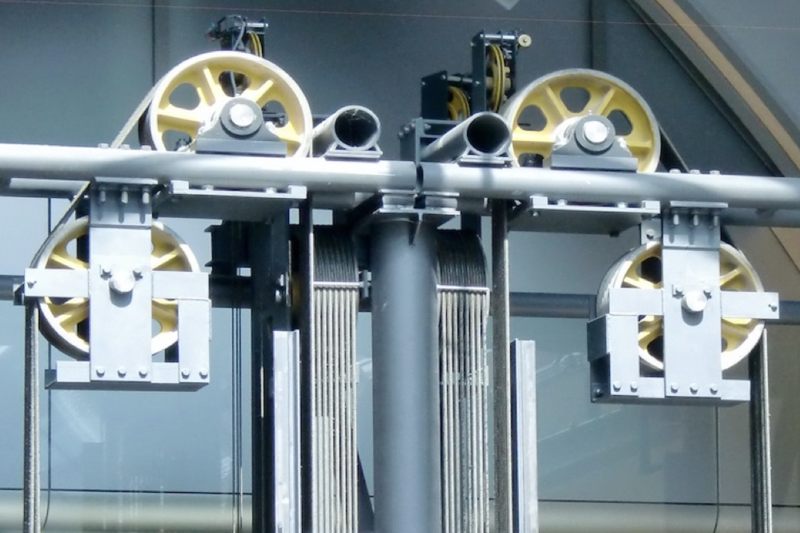 We’ll give you an honest assessment and run through the best options for your elevator. Sturm Elevator also offers residential elevator removal services in Portland, OR. If your home has an elevator that you would like removed, Sturm Elevator’s team are pros at both home elevator installation and removal. Sturm Elevator offers emergency residential elevator services 24 hours a day, 7 days a week. We’re on call at all times should you have an emergency with your home elevator. Call us at 503-284-2003 at any time, day or night. We can dispatch an elevator repair technician anywhere throughout the Portland Oregon area. In case of emergency, call Sturm Elevator! Talk to the team at Sturm Elevator at 503-284-2003 to learn more about the options and advantages of installing a residential elevator in your Portland home. If you would like to look further at our residential elevator options and installation types, click here for our main Residential Elevator installation page. That is where you will find specific models of home elevators, the manufactures we use and some specifications for a custom elevator. After you have viewed the page please call us at 503-284-2003 for your free, no obligation estimate. If time is limited and you would like to receive a call back from one of our staff, simply fill out the online contact form to receive a phone call. The team at Sturm Elevator will gladly assist you in narrowing down our many options, and finding the best plan that will best suit your needs. Often our potential customers will express concern with the significance of a home elevator installation. 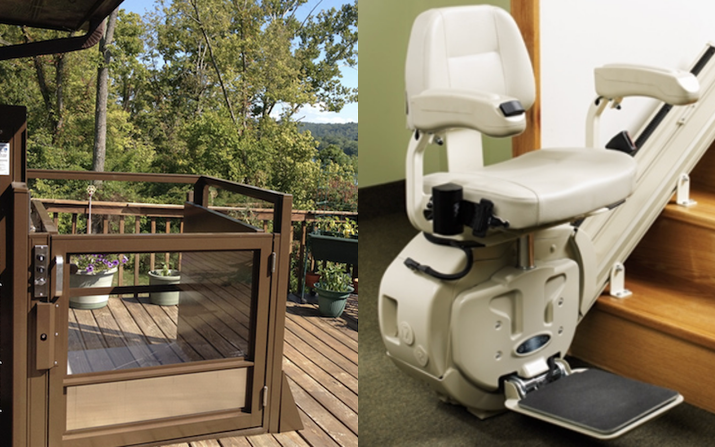 A residential wheelchair lift is a great alternative for aiding homeowners who use a wheelchair, scooter or other mobility assistance device. As you can see in the photo, a home wheelchair lift is a platform (with an enclosure, for safety reasons) that is raised and lowered between surfaces. This allows a person to move with their wheelchair. Some of our customers prefer this option to an elevator as it requires less construction modification to their home. We're here for anything you'd need regarding Portland OR wheelchair lifts. Sturm Elevator’s journeymen mechanics are expert residential wheelchair lift installers in Portland, Oregon. In fact, Sturm Elevator installs and services Oregon wheelchair lifts state-wide. We’re happy to provide a free estimate and consultation if you’d like to learn more about Portland home chairlift installation. Call us at 503-284-2003 today or click here for a more detailed look at our Portland Oregon wheelchair lifts. 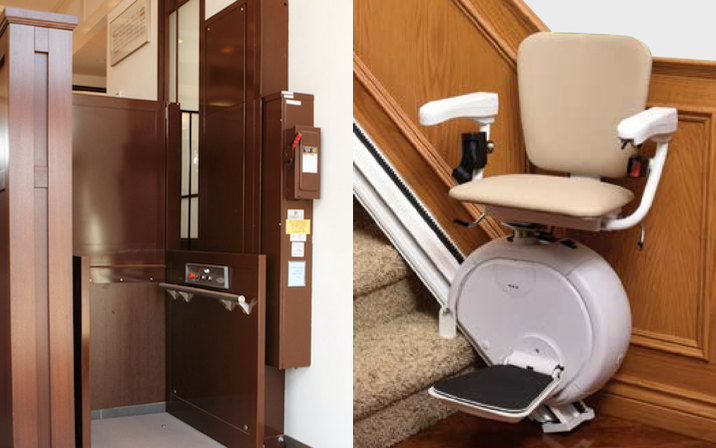 If the mechanisms and equipment of residential elevators and chairlifts look like more than you’d want to install in your home, consider a residential stairlift. Sturm Elevator is the premier installer of residential stair lifts in Portland Oregon. We also handle stair lift maintenance, service and repair. With our 24-hour emergency services, we can dispatch a technician to fix any Oregon stairlift state-wide. Throughout homes in Portland stair lifts offer a much simpler solution for those needing assisting moving up and down stairs. And stair lift tracks can even be configured to extend beyond the top and bottom of a flight of stairs, offering greater assistance to homeowners. Click here to learn more about our Portland Oregon stairlifts, then call Sturm Elevator at 503-284-2003 for a free consultation on our Portland OR stairlifts. For some, a residential dumbwaiter may seem like a thing of the past, but a modern dumbwaiter in the home is an excellent way for any homeowner to safely and easily move items between the levels of their home. Residential dumbwaiter installation in Portland by the Sturm team ensures that the job is done with the highest standards of quality and workmanship. To learn more about dumbwaiter service and maintenance, dumbwaiter repair or even dumbwaiter replacement, Sturm Elevator is the team with over 100 years of experience in residential mobility services. Our Portland dumbwaiters are both efficient and stylish, they can complement the look of your home, especially your kitchen. Call our main line at 503-284-2003 to discuss your home’s needs. We’ll review things like dumbwaiter cost, options, styles, size and more during your free consultation. Since 1911, Sturm Elevator has been helping customers throughout the Portland Oregon metro area by ensuring they can move easily and safely in their homes. 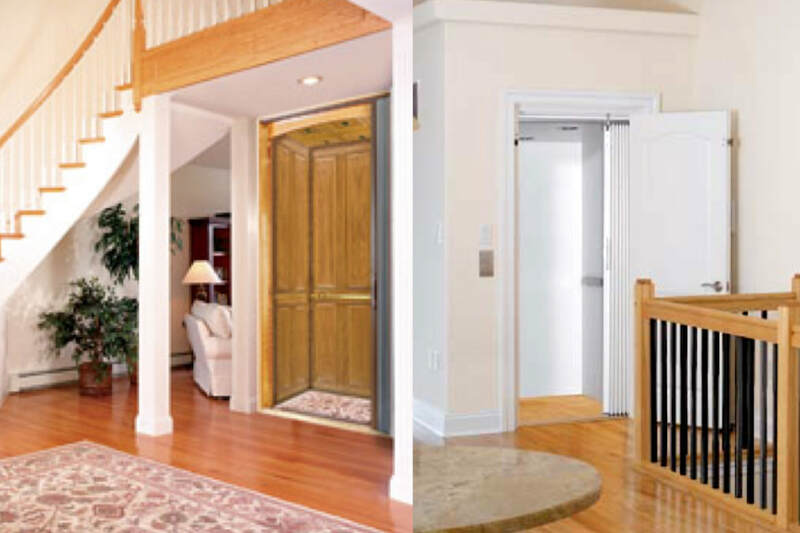 Whether you’re interested in a home elevator, chairlift, stairlift or dumbwaiter, Sturm Elevator has the knowledge, experience and skill to bring the right mobility solution to your home. Indoor and outdoor options are also available. Call us to discuss what will work best for you and your home. We’ll do a free consultation, answer your questions and offer a no cost, no obligation estimate.